Beware of the New EMV Chip Card Scam! 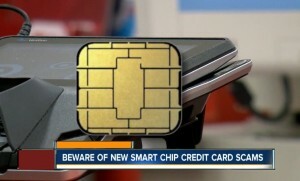 DENVER – Just three days after the deadline for businesses to install new smart chip credit card readers, scammers have already found a new way to target you and your money. The scammers are trying to capitalize on the millions who haven’t received a chip card yet. Scammers are contacting people via e-mail – posing as your credit card company or bank – informing you that in order to get a new EMV chip card, you need to update your account by confirming some personal information or clicking on a link. “Knowing that makes me want to actually follow up and get an updated card with the new chip technology to make sure,” said Cohen.